which claims that the fields marked A and B have the same gray level. Just looking at the image it is obvious that this could not possibly be. So, normally, the untrained non-scientific mind would push it aside, maybe say, wow, really?! and wander on. But this is where I came in – a trained scientist! And this scientist now really had enough of this and went on the quest to look for himself. And what do you know? 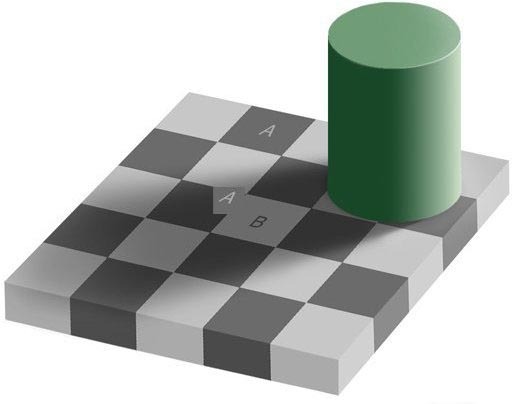 When the cut out little square from A is right next to field B, it is very clear that they are the same shade of gray – quod erat demimonstrum! And we still trust our eyes? A little shadow so that the eye ‘thinks’ that the field must be brighter, makes it brighter for the eye. Could not help contemplating how many things there are that I don’t see and how many things I see that are not there. This entry was posted in Science, Video and tagged Demonstration, eye, gray level, little shadow, optical illusion, photo shop, trick on February 8, 2008 by Merlin Silk.